Howl and Sofie's wedding day is fast approaching with one thing going wrong after another. It seems as if the universe doesn't want these two young lovers to get together. But when a young woman Howl once sought, one that had smashed his heart to piece, returns, will that be the end of their relationship forever? 2. The young woman who is after Howl's heart again should be a witch so she can "cosmically" screw with them (i.e. make it pour when they go out) Reasons for wanting Howl back and personality are up to the RPer. Magic Abilities: Succubus, she can manipulate males by looking into their eyes. Short Bio: Precious is a succubus whose only after attention and slaves. When she left Howl, after easily crushing his heart, she left without making him into a slave. Now, that's exactly what she wants to do. In order to do this, she has to kiss him, then he'll become her slave forever. It was early, far too early for Howl, when he heard Sofie walking around down the stairs. He grunted and pulled the covers over his head. It was far too cold in his room. "Calcifer," he muttered sleepily, "warm this place up." If it had been anyone but him talking to anyone but Calcifer, these words would have gone completely unheard. But despite having regained his heart from the fire demon, there was still some sort of connection between them. "Again?!" Calcifer called from his hearth, where he had been happily munching on logs until Howl's command. "Why do I have to do all the work around here? Jeez!" Still, he did make the insides of the house a little warmer. Or, at least, sent more of his heat up to Howl's room. No one else had complained yet. "I swear, that guys a freaking cat, the way he nests up in that room." He shook his fiery head at Sophie. "I don't know what it is you like about that guy." Sophie giggled at Calcifer's remark as she was pouring herself a cup of tea. She sat down and took a sip from her cup before replying, "Well, I can't say that I know why myself. I suppose when you know you've found the right person, you just know." "Good morning!" Markl called out as he ran down the stairs. He plopped down on the sofa next to Sophie. "Is Howl being lazy again?" he inquired. Sophie only laughed. "Completely," Calcifer complained as per usual. Though, as the others had discovered, his complaining about people was a sign of endearment. "Someone go poke him before I roast him." Sophie smiled and sat her cup down on the coffee table. She made her way up stairs, entering Howl's room. She didn't bother knocking. She knew it probably irritated him, but she really didn't care. She sighed when she saw him still in bed. She walked over to the bedside and pulled the covers off of him. "Howl, it's such a beautiful day and you're going to sleep it away if you don't wake up!" she scolded lightly. When Sophie pulled away the covers, Howl grabbed her wrist and pulled her down onto the bed with him. "Aw, don't be mean, Sophie," he murmured, putting on his best smile. "I was having such a lovely dream about you and me having a picnic in the garden." He kissed her cheek before actually getting up. "I'm guessing Markl and Calcifer are already up and eating breakfast?" Sophie was taken by surprise when Howl had pulled her down onto the bed with him. She got up and sat down on the edge of the bed before answering his question, "Of course. They're always up and ready before you. Ah, and having a picnic in the garden does sound like a wonderful dream. Perhaps we should make it come true?" she suggested with a bright smile. He bent and kissed her again. "We should." And then he could give her something special. Something really important he'd been meaning to give her since he'd gotten back his heart. It was sitting in his coat pocket, waiting for him to give it to her. Sophie smiled before standing. "I'll let you wash up. Don't take too long, or else you'll be having a cold breakfast," she teased as she left his room. She returned downstairs to find Markl still eating at the kitchen table. She also noticed a picnic basket sitting on the table as well and raised a brow curiously at Markl. Markl returned Sophie's gaze and with a mouthful of food, he grinned. Today was the day, he just knew it. "It's so nice out and the two of you haven't done anything alone together in awhile. Right, Calcifer?" he asked the flame after swallowing his food down. Calcifer shrugged as best as a fire could. "Well, it's been raining. And snowing. It's like the weather's out to get you lately," he said to Sophie. "It's the first clear day in weeks. Go. Enjoy yourselves. Markl and I can take care of things." Howl grinned and got dressed. He took his time getting, since he still wanted to look good, but it still didn't take him long to head downstairs. "Morning, Markl. Calcifer." He noticed the picnic basket as well. "I'm guessing someone wants us out of the house?" he asked, raising an eyebrow at his apprentice. Markl grinned and gave a small nod. He hopped off of his chair and grabbed the basket, practically shoving it into Howl's arms. "You had better do it today," he whispered so that Sophie could not hear. Sophie tried to listen in to Markl's exchange with Howl. However, she couldn't understand what the apprentice was saying. Something was going on and she really didn't like being left in the dark. She shrugged, grabbing a light coat. It was still a little chilly out. She would get some sort of information out of Howl eventually. "Thanks," he said to Markl, returning the conspiratorial grin. "Shall we, Sophie?" He turned the dial so that it led to the garden, and opened the door for her. He bowed politely, and when Sophie was outside, followed her. They went by the creek and found a dry patch to set up a blanket. He retrieved from the basket some bread Sophie had baked the day before and some muffins and coffeecake from this morning. He also pulled out some juice, glasses, plates... Too much to fit in one basket, but as it was enchanted, physics didn't apply. Breakfast wasn't a conventional picnic, but it would have to do. Who knew if the weather would hold to this afternoon, after all? When Sophie was done eating, she looked up at the sky before laying down on her back. She watched as the clouds floated by, trying to figure out to herself what each one looked like. A giraffe, a face, even a castle. She smiled. "Today is such a lovely day. I've missed this kind of weather. The weather has been so unusual lately," she said. Howl reached into his pocket and felt the small box that sat there. He had to do it, and he had to do it now. "Sophie. There's something I've been meaning to ask you for a while..." He pulled out the small black box and popped it open, revealing a ring. It didn't look like much, just a thin silver wire with a glittering blood red jewel called a fire ruby. "Will you..." He'd never felt so nervous before. He had to take a deep breath before he could continue. "Will you marry me, Sophie?" Sophie sat up, gazing at Howl in shock. Well, she knew now why they had all been acting so odd earlier this morning. She wasn't expecting it to be because of a marriage proposal, though. She sat there in silence for a long while until the initial shock finally passed. Then, she smiled brightly and lunged into his arms, knocking him down onto the ground. She chanted, the weather changing abruptly. The skies transformed black, clouds swirling as heavy winds whipped the couple's skin. Hail began to pour down and lightening began to strike the ground, dangerously close to the two. The weather grew more violent by the second, tornado's touching down. Just as Howl was about to put the ring on Sophie's finger, a sudden downpour started, which quickly turned to hail. Howl waved his hand, creating an invisible shield over them like an umbrella to protect them from the hail, but it did nothing to protect them from the wind. "We have to go back!" he shouted over the roar of the wind. He grabbed her hand and made a mad dash for the door. The ring was safely in his pocket again. The perfect romantic scene he'd envisioned was ruined in a moment. They reached the door just as the tornados touched down. Howl whipped open the door and slammed it shut behind him. He turned the dial, putting them back in Market Chipping, Sophie's hometown. Calcifer's googly eyes turned on them. "What happened to you two?" he asked. "You're both soaked!" He also glanced at Sophie's hand, which had a ringless ring finger. "Where's the ring?" 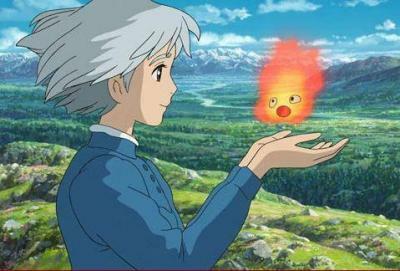 "Right here," Howl said, retrieving it safely from his pocket. Despite the fact they were both disheveled from the sudden storm, he went on one knee and slipped the ring on her finger. After she had caught her breath, Sophie thanked him. "That was very strange," she muttered. The weather had been that way for several weeks. Something obviously wasn't right, but she wasn't about to let it ruin the rest of this day. She smiled down at Howl and she grabbed his hand and pulled him up before kissing him on the lips. "Get a room you two," Calcifer groaned. "I don't want to see you two get all lovey-dovey. It's gross." 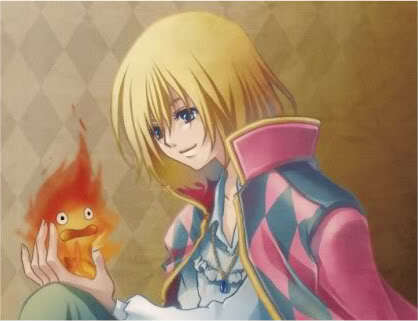 "Says the fire who loves eating egg-shells," Howl snapped at the fire. He then held Sophie close to him and kissed her again, the romantic kiss he wished he could have given her at the picnic. At that moment, Markl walked into the room and made a face. "Yeah, Calcifer is right. You two should go get a room. My eyes..." He covered his eyes with his hands before making his way out of the room, hitting the wall before he had finally exited successfully. Sophie laughed. "Ah, perhaps the two of them are right," she murmured softly. Howl blushed. He actually blushed. With his heart back, it certainly was a lot easier to embarrass the heck out of him. "You two be quiet! Just wait until you get a girlfriend, Markl! 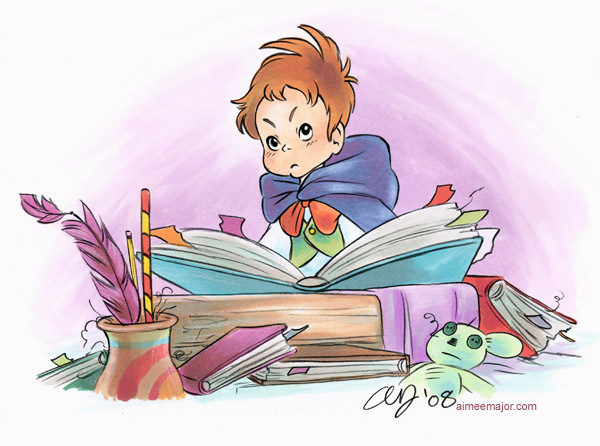 I'll make sure to tell her all about the mishap when you tried to use my potions in the bathroom!" That incident had ended with the young apprentice having vibrant green hair. He coughed lightly to regain what little composure he had left. "A-anyway, I was wondering, Sophie, what one actually does for a wedding." He'd been a skirt-chaser for so long without a heart that he really didn't know. Sophie was taken aback by Howl's question before bursting into a fit of giggles. "Oh, Howl," she said through giggles. "Where to begin... Well, it's basically a ceremony that binds us together in a way. There are guests and there's food and cake... and I have to wear a nice, white gown and you have to wear a tuxedo..." She went on and on, trying to explain the process of a wedding. When she realized she had begin blabbering on and on, she stopped and blushed. "Sorry. I got carried away there. But you understand now, right?" "I think so," Howl said. He'd gotten the basics. Ceremony. They exchange vows of loving each other for eternity. They exchange rings, a symbol of their vows. And then they kiss, sealing the deal. It seems a bit tedious, but who was he to complain? He loved Sophie more than anyone or anything--even more than he'd loved himself before getting his heart back--and if that was what it took to ensure a happily ever after, well, he'd do anything. Then a thought struck him. "We should probably tell your parents. And your sister. You said you had a sister." They had to share their happy news with Sophie's family. Howl didn't have anyone to tell except those already present for the news, so really it was just Sophie's family and friends. Sophie gasped. She felt terrible that she hadn't thought about that to begin with. "Oh my goodness! You're absolutely right," she exclaimed. "We should probably do that... Today if you'd like to," she added. "The weather's fine in Market Chipping and in Kingsbury," the fire piped up. "No freak storms there. Now's the time to go." "Right," Howl said, nodding his thanks to the fire. Then he realized that he didn't know where her parents or sister actually lived. "I'll let you lead the way."